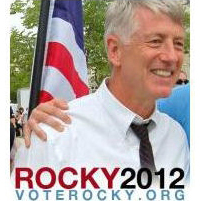 Rocky Anderson is the Justice Party candidate for the Presidency of the United States. Meet Rocky and hear his plans for his first 100 days in office. Music by: Lowell George, Bonnie Raitt, Joe Jackson, Kelliana, David Lindley and El Rayo-X, John Trudell, Lene Lovich, Buffalo Springfield, Aimee Mann, Lindsey Buckingham, John Gorka, and Kirsty MacColl.